This shameless commercial plug comes as the result of a good deed. I have listened to and written about the Boulder, Colorado choral ensemble the Ars Nova Singers for longer than a decade. They have 10 recordings to their credit, and the latest is the recently released "Yuletide." I am the most intolerant of Christmas music auditors, as my earlier "Pop culture Christmas: the perils of carols" story shows. When Ars Nova asked me to come to their one of their concerts this holiday time, I let them know I didn't have the ability to publicize their efforts widely. In keeping with their kindness, which is as strong as their musicianship, they asked me over anyway, and sent me a copy of their new CD. Isn't that nice? And it's quite good. Thomas Edward Morgan's choir has created a body of strong, diverse vocal work that ranges from early-music to contemporary pieces, many arranged by Morgan himself. "Yuletide" is no exception. 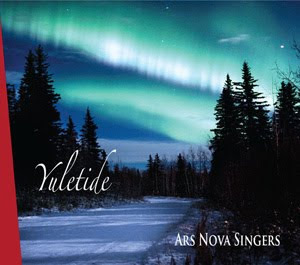 The 44 members of Ars Nova distinguish themselves with a cappella work that handles the complexities of Taverner and the smooth sweetness of Vince Guaraldi's "Christmas Time is Here" with equally luminous blend and tone. The 16 tracks included here complement their previous seasonal fare in 1993's "A Floweret Bright" and 2000's "Midwinter." It's a privilege to hear this work. And it's not too late to get a copy. Go to www.arsnovasingers.org.